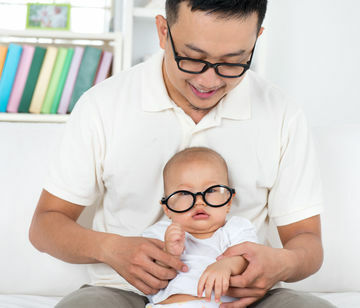 A new study suggests that older fathers are more likely to birth "geeky" sons. Yeah, we didn't see this one coming either! Amal and George Clooney just welcomed twins, and you might expect that their little ones may become future Hollywood royalty or high-powered lawyers. But if recent research is any indication, the couple's son, Alexander, may be destined for a career in science. Why, you ask? It's all about his dad's age. At 56, George is, by most accounts, on the older end of first-time fathers—and according to a new study, advanced paternal age may be linked to "geekiness" in male offspring. How does this study—which was published in Translational Psychiatry—quantify geekiness? Researchers measured specific traits among 15,000 12-year-old twins from the U.K.—they assessed things like non-verbal IQ and social aloofness. The researchers also asked the parents of their subjects to report their childrens' interests and how much they seemed to care about how they were perceived by peers. The scientists created a "geek index" by which to measure these traits, and they found a relationship: Sons born to older fathers appeared to be "geekier" than those born to younger men. The researchers accounted for other factors that could influence these findings—think socioeconomic status and employment—and still determined a link. This is good news for older dads: Their children appeared to do better in school and excel in science and technology. Interestingly enough, the researchers only believe this link affects sons, not daughters. This is definitely a surprising finding—and one researchers can't quite understand. There's no clear explanation for why this link may exist, but the researchers theorized that since older men tend to have more established careers, their children may grow up in settings conducive to producing those "geeky" traits. There's also a surprising tie-in to the link between advanced paternal age and increased autism risk—researchers believe that there may be a bit of an overlap between the traits they used to measure geekiness and those associated with autism. "Our study suggests that there may be some benefits associated with having an older father. We have known for a while about the negative consequences of advanced paternal age, but now we have shown that these children may also go on to have better educational and career prospects," researcher Magdalena Janecka said, according to a news release. "When the child is born only with some of those genes, they may be more likely to succeed in school. However, with a higher 'dose' of these genes, and when there are other contributing risk factors, they may end up with a higher predisposition for autism. This is supported by recent research showing that genes for autism are also linked with higher IQ." While the link between older fatherhood and autism may scare you, we'd urge you to not let it stress you out—instead focus on the possible benefit that older dads may see in their (super smart and successful) children.